Want to create brands that press your customers' buttons? You need some psychology. Building a brand that really connects with your customers can seem like an uphill struggle, with more than a little guesswork thrown in for good measure. Even if you have one of the best logos ever, it can still feel like branding is a process of trial and error. However there's one technique that you can use to create brands that really connect with their audiences, and all it needs is a little psychology. What you need to start thinking about is brand archetypes. Swiss psychologist Carl Jung came up with the term 'archetype' to describe fundamental personality types that we all respond to, one way or another. According to Jung there are 12 archetypes, each of them characterising universal patterns of behaviour that we all understand instinctively because they appeal to basic human desires that are hardwired into us. Because we're all individuals with our own tastes, quirks and desires, we're all attracted to different archetypes. Brand archetypes reflect the same behaviour patterns; the trick here is to align your brand with an archetype that your customers will react positively. If you can do this, you can create a much deeper connection with your audience and reap the benefits in the long term. So how do you find your brand archetype? It's all down to knowing your customer's personality, and then selecting an archetype that will appeal to them. So for example, if you discover that your customers just really want to belong and fit in, the Everyman archetype is the one that should speak to them. The challenge, of course, is giving your brand a personality and tone of voice that reflects your chosen archetype; you need to really go for it. If you try to hedge your bets and appeal across a wider board, your brand will just sound confused and you won't make the deep connection that you'll get with a keenly focused brand archetype. You just need to bite the bullet and accept that your brand archetype will definitely alienate some potential customers, but the ones you attract will stick with you through thick and thin. Want to know more? 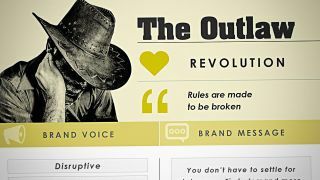 Branding agency Iconic Fox has come up with a helpful guide to harnessing the power of brand archetypes, complete with useful infographics that'll help you define your brand strategy. If you want to create brands that really seize your customers' attention, take a look today.